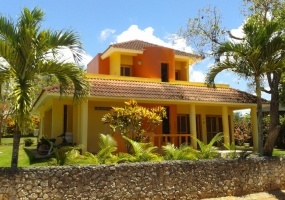 Superb villa with two magnificent bedrooms and a fully independent self contained studio. All with ocean view in a private exclusive communityThe 375 m2 villa is surrounded by a colorful tropical landscaped garden of 3.000m2 which also contains a bowling pitch.. All the rooms in the villa have direct access to the large swimming pool and are equipped with W.C.
Picturesque home in private community! !Beautiful home on the green hills of Rio San Juan. Only 2 kms from the town center on new paved road.The house has a big living room with big windows which has access to the front porch and the backyard. Also the American style kitchen has access to the colorful garden. There is also one bedroom and a guest bathroom with Italian style shower. Brand new modern villa with beach access.This magnificent villa is one of the few that has direct beach access and the only one next to a National Park. The villa has spectacular swimming pool, colorful gardens,fruit trees, ocean views, soothing breezes.Just walk down to the empty beach and get under the fresh water mini waterfall. Take a stroll through the National Park. Great home in the peaceful green hills with amazing ocean viewThis amazing villa is located up on the green hills of La Catalina. 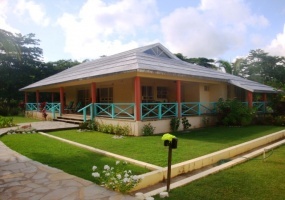 It has an exceptional ocean view and it is surrounded by green lush vegetation. there is a small stream that runs right in front of the colorful garden. Cute House on the hillsThis house is owned and was built by an engineer. It is located in the hills of La Catalina where most of the foreigners live.It is near many beaches and since it is on a hill there is a nice breeze all year round. Nice house in the peaceful side of town! !This house just came into the market; it’s located in Cabrera in a super quiet area with a nice mountain view. Walking distance to all the stores.5 bedrooms, 2 bathrooms, garage, water cistern of 1.500 gallons.It has a pleasant garden with all the fruits you can imagine. bananas, mangos, avocados, lemons, papaya, zapote, sour sop, and more. 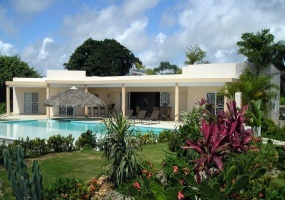 Villa with one of a kind ocean view and forest viewThis is a special villa and there are three main reasons. The first one is the unobstructed and out this world ocean view and the back rain forest view. You will not find another place with both excellent views. The second reason is the proximity to town. Splendid Villa with unique ocean view! !Casa Om is located at the edge of a high cliff overlooking the vast blue ocean and the amazing green vegetation below. The view is second to none and right at the edge you have the infinity pool making this place a true paradise.The modern style home is in the most prestigious gated community only 3 minutes from town and there are more than 15 beaches nearby. 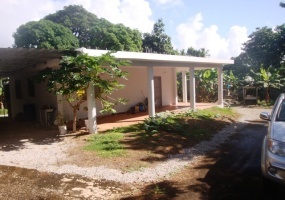 Country home fully functioning This property is located 5 minutes from the center of town. It has a construction M2 antisemitic and anti hurricane.It has a wall surrounding the perimeter, huge garage, water cistern of 20. Excellent villa in exclusive gated community!